Meatatarians rejoice! 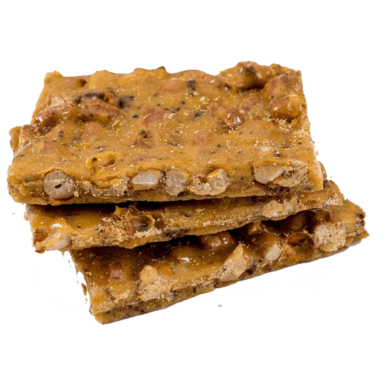 This original Smokey Bacon Peanut Brittle contains chunks of real smoked bacon savoury treat that lingers long after the last bite. Tastes like carefree summer nights - no responsibility: mom even still does your laundry! The sun stays out past your bedtime, and there's always meat on the grill. A nostalgic Canadian classic. 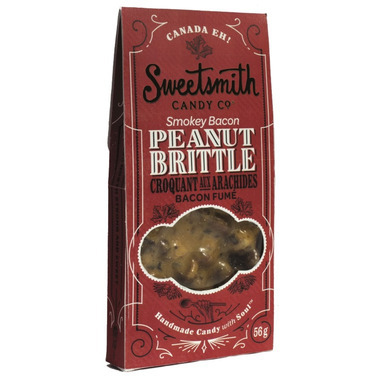 Ingredients: Cane Sugar, corn glucose, peanuts, bacon, (cured wth water, salt, sodium erythorbate, sodium nitrate, dextrose, brown sugar, sodium phosphate, potassium chloride), sodium bicarbonate, natural smoke flavour. Made in a facility that processes nuts, soy and dairy. So good that you canâ€™t just eat a small piece.